Chief Siemens (ret.) started his career with Alberta Forest Service. He later joined the Edmonton Fire Department and during his career he attended the University of Alberta as well as enlisting in every aspect of training within Edmonton’s Emergency Services. He left Edmonton after 35 years of service and in 2008 he took the position of Emergency Services Coordinator in Lamont County to begin building a regional emergency service. In May of 2009, Lamont County as well as neighbouring counties were devastated by several large forest fires. Direction of operations in suppression of these fires was successful under Randy’s leadership. He was seconded by OFC to work as a Deputy Fire Commissioner developing plans for SAR and Fire in the Province. 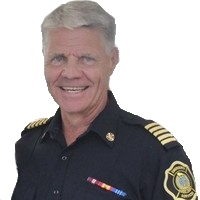 Chief Siemens held the position of Director with AFCA for several years. Throughout his career Randy has developed and participated in many tabletop and live exercises. For the last two years he has been involved in speaking engagements and consulting work in the field of Emergency Management. Awarded the Queen’s Service Medal for exemplary service by the Governor General of Alberta and twice more for years of service (30 and 40 years). Spring 2016, fires devastated over 20sq mi in Lamont County, destroying over 20 structures. This fire was brought under control quickly and managed in large part to better training, communications, and equipment put in place over Chief Siemens’ tenure.